Some friends gave me one of these very cool devices for my 60th birthday. I was really excited to receive it, because I was familiar with the Institute of HeartMath and I knew it would be excellent because they created it. But--I didn't think I needed it! I'm a pretty relaxed guy, and have practiced meditation for many years. I regularly teach classes and write on the topic of stress management and stress management strategies. My health is good and always has been, so I naturally assumed that my stress level was low on a consistent basis. I was wrong! When I first started using the EmWave, I was amazed to find that I had to really concentrate to lower my stress on Challenge Level 1, and had very little success with Challenge Level 2--and there are 4 Challenge Levels! My learning started immediately. How to bring my heart rate and breathing into coherence, or alignment. How my thoughts immediately affect my heart rate and stress level (part of the training is to keep your thoughts focused on things that feel good). Subtle but significant changes in my feelings that really matter, and affect my breathing. Awareness of my breath, and how I actually stop breathing when I think about stressful things. How the bio-feedback from the EmWave stress management tool gently guides me to a deeper and deeper level of relaxation and well being that lasts after I turn the device off and go about my day! Order Your Emwave2 Device Now! More heart awareness--of all the stress management strategies out there, this one helps you focus on your heart. This makes you more loving, compassionate and open-minded. A better attitude--the practice of focusing on thoughts that feel good and bring positive emotion is good mental training, and I find my thoughts becoming more positive the more I use the EmWave--the best of all stress management techniques! Better sleep--this one is big. I have had some minor sleep issues, but I know a lot of other people suffer tremendously with this issue. Awareness of how my stress level rises and falls in different situations, and with different thought processes. Sometimes I use the EmWave while doing other things, and I hear the little bells going off, telling me that my stress is going down. Then I look at what I was thinking, feeling or doing that brought about the change. It is very informative! Check out this video featuring the CEO of HeartMath, talking about stress, how it can be good or bad, and how your heart is the most powerful organ in your body--60 times more powerful than your brain as a stress management technique! When you connect with your good heart with stress management techniques such as meditation, relaxation and prayer, you will automatically become more compassionate and kind to the people around you. These types of practices are good for your breathing, circulation and digestion, meaning they are good for your overall physical health. You will naturally and automatically become happier as you engage in a regular and consistent spiritual practice and other stress management strategies. Please keep in mind that we receive commissions on all sales of the HeartMath products made through this site. 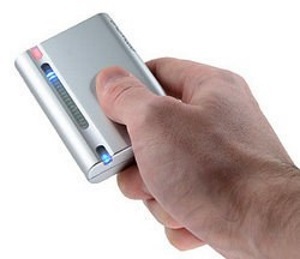 Claim Your Personal Stress Management Hand-held Device Now! Happier, because you're not waiting for someone (Santa Claus, the Tooth Fairy or the Prince Charming) to come along and "make everything okay." In the driver's seat. You are in charge of your life, with all of the freedom and responsibility that goes with that. In other words, your stress management techniques are yours to use any time you need them! Of all the stress management techniques I could suggest to you, the best would be to develop a spiritual practice and dive deeply into the realm of self help and self improvement.